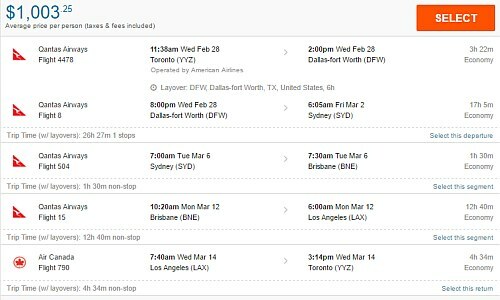 Qantas (a great airline) has dropped the price of their February, March, April, and May 2018 flights from Toronto to Sydney, Brisbane, and Melbourne, Australia down to $981 CAD roundtrip including taxes. It's also possible to turn these into 2-in-1 trips and visit both Australia *and* Los Angeles or San Francisco, and keep the price at $981 CAD roundtrip. 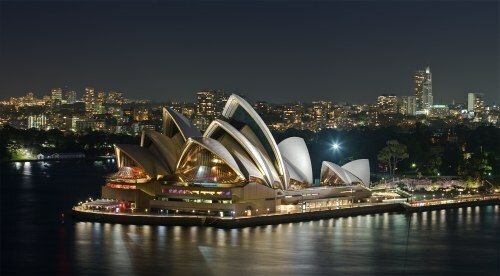 You can also find 3-in-1 trips that allow you to visit all 3 of these major Australian cities (Sydney, Brisbane, Melbourne) on one trip for just $27 more ! TIP: Try starting with Monday, Tuesday, Wednesday, and Thursday dates. Once your search completes, click on 'Flexible Dates' and look for the flights that are $981. You can also try clicking on '1 Stop Only' on the left hand side after your search completes. 1. First, I would recommend successfully finding a normal roundtrip flight to Australia using the method described above. Keep those dates in mind, and we'll be using them to help find our 2-in-1 trip. 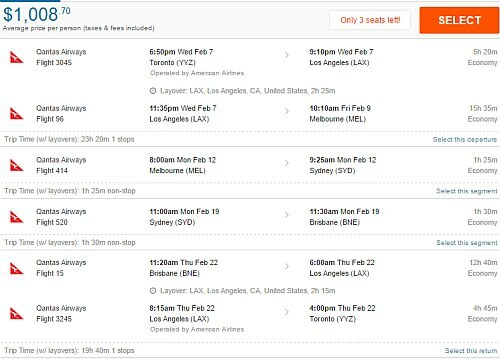 For example, let's pretend you successfully found a regular roundtrip flight from Feb 28 to Mar 14.
or, if you'd like, try using Brisbane or Melbourne instead of Sydney. 4. As for the dates to use, for the first and last legs of the journey, try using start and end dates that are similar to the regular roundtrip flight dates that I asked you to keep in mind from Step 1. I would recommend first attempting to find a 2-in-1 trip using the instructions in the paragraph above. Once you have found a 2-in-1 trip, try using similar dates to find a 3-in-1 trip. Variations: You can try substituting San Francisco for Los Angeles. 4. As for the dates to use: focus on Monday, Tuesday, Wednesday, and Thursday dates in February, March, April, May and June. NOTE: Once your FlightHub search completes, click on '1-stop only' on the left hand side. toronto, yyz, united states, san francisco, sfo, north america, los angeles, lax, melbourne, sydney, australia, mel, syd, australasia, oceania, brisbane, bne and qantas. 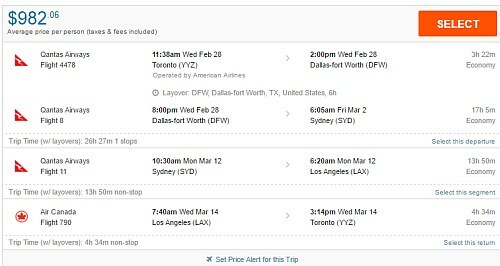 6 Responses to "Toronto to Sydney, Brisbane, or Melbourne, Australia - $980 CAD roundtrip including taxes on Qantas | add Los Angeles or San Francisco for free"
Do these deals work for business class as well? Unfortunately business class fares are still their typical 5 to 7 grand! They are a pretty massive booking site, especially in Canada. When I see a complaint about them, it's generally in regards to customer service - although that's pretty much a staple of every booking site. If you click on the 'Airfare Booking Sites: Power Rankings' article, near the top right of this website, it will give you some more info on them, and a few things to watch for. Thank you Chris so much, I got two tickets for total 1,815 with a stop in Melbourne, Sydney and LA - my son's dream will come true thanks to you! Nice one Ana! Have a great trip with your son (if the other ticket is for you).